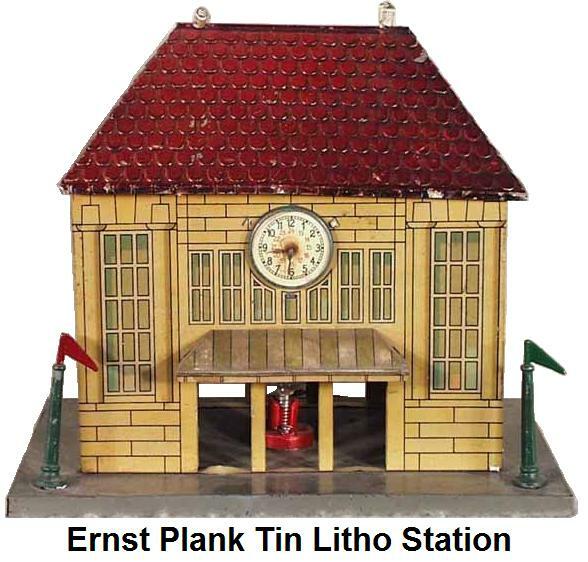 Ernst Plank & Company started out in 1866 in Nüremberg Germany as a toy-repair shop. Named after the company founder, they made magic lanterns, steam engines, die cast metal planes, boats, cars, steamboats and sewing machines produced from pressed tin plate. At one time it was the second largest manufacturer of magic lanterns. The company was located at Hochfederstrasse 40 in Nüremberg. Plank's toys were notable for their quality, often being ornate in design and more finely finished than other manufacturers of that era. 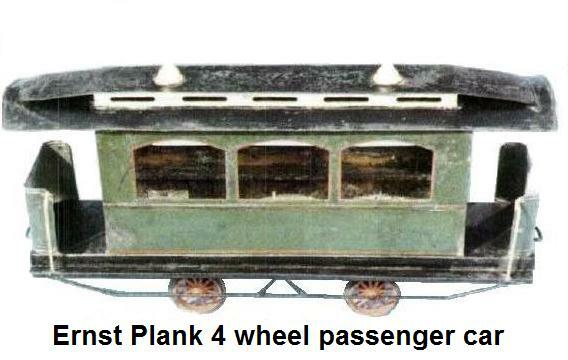 Plank produced it's first toy train in 1882. 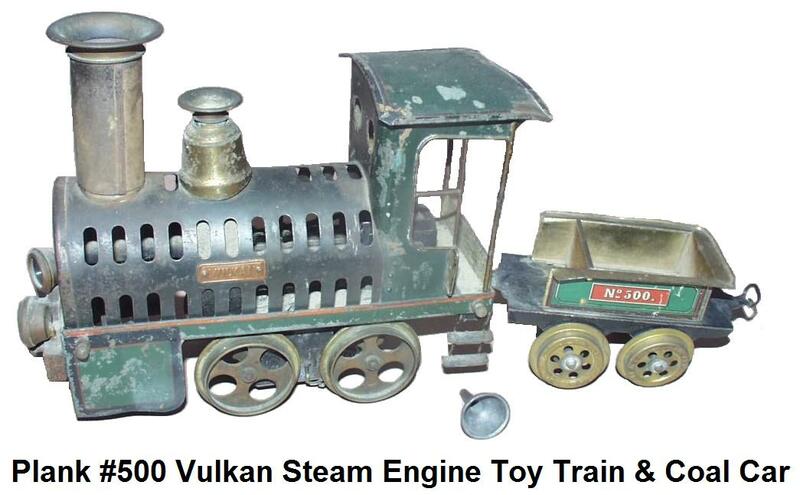 The early trains made through 1885 were gauge III (2½ inch track gauge) and were marketed as complete sets that included a steam powered Ernst Plank Vulcan locomotive, four-wheel lithographed rolling stock with pressed brass wheels, and a circle of track. Track was made of tinplate, and came in sections that were put together and held in place with steel pins, just like the tinplate track sections manufactured today. Many of the trains were hand enameled and contained a high level of detail, such as curtained windows on the passenger coaches. American-profile trains were made expressly for the U.S. market. By 1900 Plank's catalogs displayed a huge array of electro-physics gadgets and a full spectrum of optical devices, toy boats, stationary steam engines, and locomotives. The catalogs were richly illustrated as almost every apparatus was accompanied by a detailed engraving. Even a steam turbine locomotive was offered. Some of the trains were designed to run on track, while others were for floor operation. The front wheels usually had very thin flanges on the track runner models, and could be turned and locked, so that a circle radius could be run on the floor, without the use of track. Track gauge was 2½", but the 'scale' was between 'O' and Standard. Plank dubbed its 65mm product as 8 gauge. Eight major manufacturers of model steam engines conducted business in the Nüremburg area: Bing, Carette, Doll, Falk, Krauss Mohr, Märklin, Plank and Schöenner. Along with firms like these, Ernst Plank set the standard for the Golden Age of European toy manufacturing. Plank equipment is easily identified by the trademark embossing that had the letters 'EP' inside a cirlce surrounded by a winged wheel. 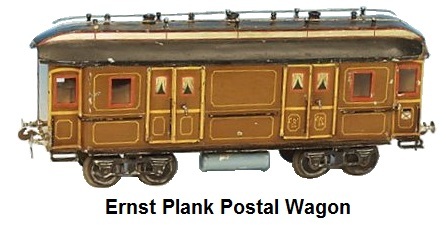 Plank amazed the toy world in 1882 by introducing Germany's first electric train. They are famous for their so-called "stork-engines". 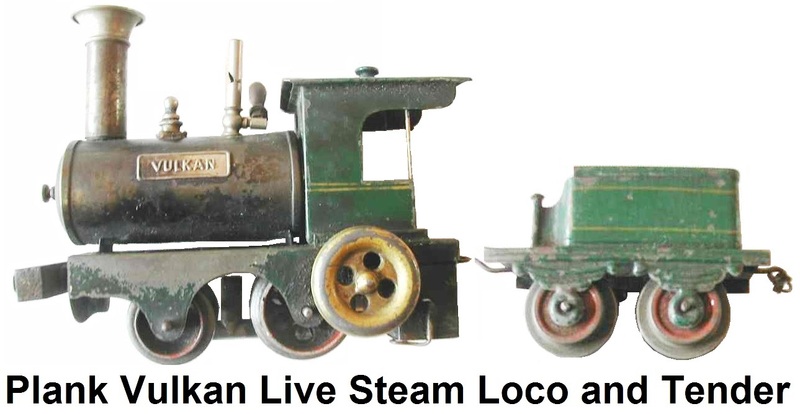 Their "Black Prince" is one of the most wanted live steam trains for collectors. 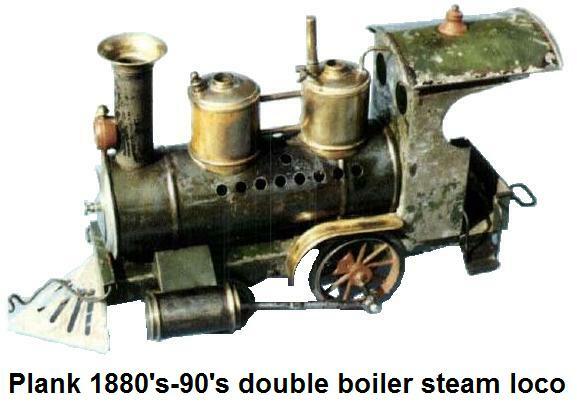 The company also produced clockwork powered tinplate trains. Plank survived the First World War, however, the company was one of the many firms that suffered from the 1929 depression and economic crisis. The company was sold in 1932 to brothers Hans and Fritz Schaller, who bought the factory largely to get the optics from Plank's magic lantern line. Schaller specialized in home movie equipment. 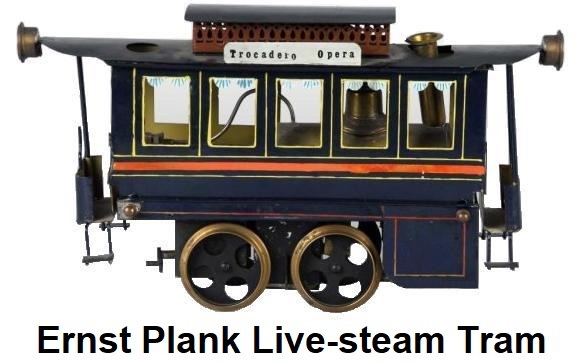 Today, Plank trains are very rare and highly collectible. 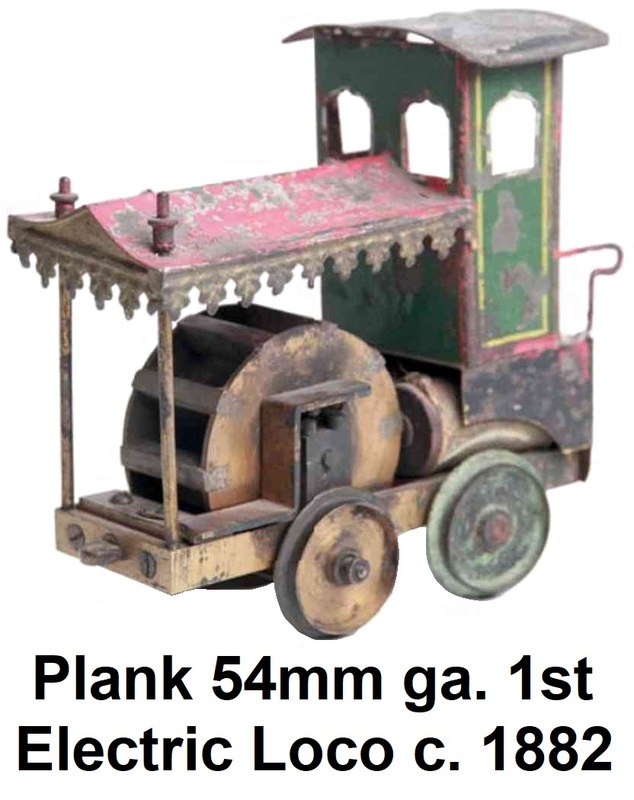 A rare Ernst Plank gauge III live steam passenger train set with a locomotive, tender and two passenger cars and a circle track in its original wooden presentation box, from the collection of Ward Kimball brought $46,750 at a June 2005 auction.